I won't pretend I can go all harmonizing like the original three, but Pancha seems to enjoy it. She wags her tail anyway. At least she doesn't usually run away. Aaa, so let's talk about things we love in the morning, and the afternoon and even in the evening. Beans. Oh seriously, I said beans. Beans again. And especially bean dip. I find bean dip to be an ingenious thing, really. It makes raw vegetables even more appetizing, is healthy unto itself with protein and other healthy bean things, and it tastes good. This one tastes really good (even though it's from a book called the Eat-Clean Diet Cookbook and I normally don't go for books with the word 'diet' in the title because eating, to me, is not about The Diet, even if it's healthy. Can healthy eating please not be about diets for once? Sheesh.) And it's easy, although not as easy as some dump and blend recipes. You have to roast a head of garlic first (Worth It) and the recipe calls for Tuscan spices, a blend you might not have. I'll share what I used instead. To roast your garlic, cut off the very top so that the cloves are exposed and the very tops of the cloves have also been sliced off. Drizzle with about a tablespoon of oil, then wrap in foil, and bake in an oven preheated to 300F fir 15-20 minutes, until the cloves are soft. Unwrap and let cool while you work on the rest. 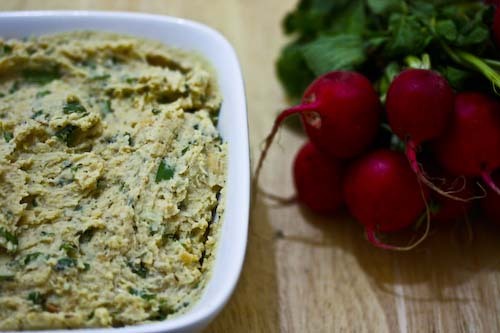 In a food processor, combine the garlic and the rest of the ingredients except the fresh herbs. Process until you achieve the texture you like. You can process until it's creamy as hummus, or leave it with a few lumps (I like to call that texture). As you process add oil until it reaches your preferred consistency. You can add the herbs now and pulse, or you can just fold them in if you like them a bit more...present. I folded. Transfer to a serving bowl and enjoy. Lovely recipe for super bowl Sunday...very nice blog. Haven't heard Skinnamarink in ages, LOL! My fave was Pufferbellies! This spread sounds nice and creamy and tasty and healthy!